FULL TIMEThe Hawks have beaten the Cats by 36 points, to win a spot in the Preliminary Final, the Cats will do it tough this year, playing the winner of the Bombers and the Kangaroos next week. GOAL HAWKSLangford grabs it from the middle of the pack, he snaps at goal and he kicks a sweetener for the Hawks. BEHIND HAWKSThe ball slips through the hands of Gunston and through for a rushed behind it goes. GOAL CATSJohnson gathers the tap from Selwood, as Stevie J runs to the 50, has a long shot on goal and he kicks it through for a goal. GOAL HAWKSLangford hands it over to Lewis, as he runs into the 50, he chips it through for his third goal of the night. It is party time for the Hawks. BEHIND CATSTaylor takes the mark on the 50m line, he takes the shot on goal and roosts it away to the right for a point. BEHIND HAWKSGunston takes the mark 45m from goal, near the boundary. He comes in and hooks it to the left for a point. BEHIND HAWKSLangford with a quick shot on goal, but it is offline and through for a point. Puopolo runs for the bouncing ball, as he gathers it on the boundary, but he is upended by Thurlow. GOAL HAWKSLewis gathers it from the pack, he casually kicks for goal and puts the result of this contest beyond doubt. Hawthorn by 28 points. Stevie J could be in trouble after an incident with Gibson. He does have a poor record, so for the Cats fans sake, he better not be sighted by the MRP. With just over seven minutes left on the clock, the Cats will need to kick four unanswered goals to win this one now. GOAL HAWKSBurgoyne takes a run, takes two bounces, measures the kick to a leading Roughead and he gets him, 35m out on the boundary. He kicks a goal, the Hawks lead by 22 points. The Hawks clear it from the back line, after a big kick from Hodge. The Hawks players realise that they have time on their side. BEHIND HAWKSBreust snaps at goal and it bounces through the wrong side of the goal post. 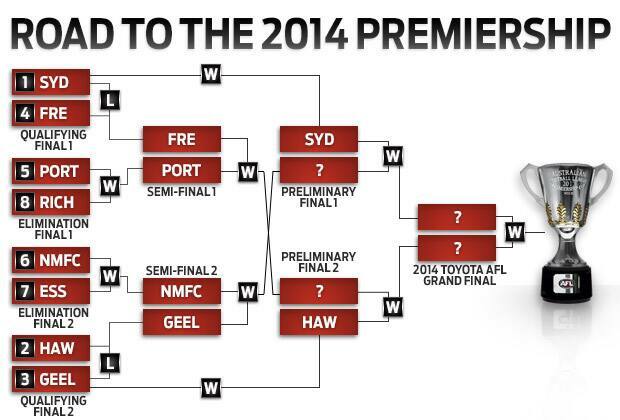 The Hawks are about one or two goals from booking a spot in the preliminary final. BEHIND HAWKSThe Cats tap it towards the goal line and it goes through for a rushed behind for the Hawks. Hill was on the chase, so the Cats are lucky they did not concede. The tension is visible on the ground and off it, with the game hanging in the balance at this stage of proceedings. There is still plenty of time left on the clock for the Cats, as Johnson comes off the ground with the blood rule. GOAL CATSA superb kick by Selwood, as Blicavs marks it on the goal line. He takes the set shot on goal and he threads it through to give the Cats a pulse. SUBSTITUTION CATSMcIntosh has been subbed out of the game, with Thurlow coming on to replace him. It hasn't been a memorable night for the H-Mac, with 8 touches and 15 hitouts. BEHIND CATSLonergan is pushed in the back and the umpire gives the free kick 45m from goal. He kicks it away to the left for a point. BEHIND HAWKSRoughead takes a set shot on goal, but it falls short and it is punched through for a rushed behind. Team Cats are in trouble, as they have not scored a goal in over 22 minutes. GOAL HAWKSBreust gathers it just inside the 50, he takes a side step, kicks a worm burner for goal and it bounces through. Mitchell has been a prime mover for the Hawks, with 32 possessions to his name. We are back under way for the final term, as the Hawks get first hands onto the ball. 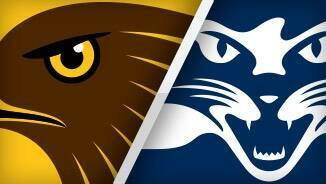 THREE QUARTER TIMEThe Hawks go into the final break holding a 14 point advantage over the Cats. BEHIND HAWKSRoughead is taken out of the contest by Rivers, as the umpire awards the free kick 20m from goal directly in front. He kicks it to the right side of the post. The Cats must score the next goal as the Hawks are threatening to run away with the contest. Tempers are starting to come out from players of both teams, sick of the close checking. Great clearance from Gibson, in the last line of defence, as the Hawks look to set it up in attack. An untidy jumper punch from Hawkins may have him being the talk of the Match Review Panel on Monday. Duryea wraps up Blicavs on the boundary. The big cat is not happy with the attention that he is given. The Hawks are building here, as the Cats start to trail off a bit. It may well be time to bring on some fresh legs and activate the sub. GOAL HAWKSGunston reads the flight of the ball beautifully as he takes the mark 25m from goal, directly in front. He kicks his third goal of the game and the Hawks lead by 13. Varcoe and Motlop have not touched the ball this term, which is a bad sign for the Cats. The winner of this game will host a preliminary final in two weeks time, whilst the loser of this game will face the winner of Essendon and North Melbourne. GOAL HAWKSThe seas part for Gunston, as he runs to the 50, unloads for goal and it bounces through. The Hawks are out to a seven point lead. The Cats now need to reply as the Hawks are always a dangerous team after they have kicked a goal. GOAL HAWKSHodge follows the ball in the air and he takes the mark on the goal line. He is pushed onto the boundary, he kicks the banana and it is straight through the middle. Gunston and Breust have not been their busy selves tonight, with only the one goal between them. GOAL CATSLake puts his left hand into the back of Hawkins, as the umpire awards him the free kick 35m from goal. He nails it. The Cats are back in front. Breust gives it off but it is to a Geelong player as the Cats take it out of the back line, delighting their fans with the clearance. BEHIND HAWKSRoughead slides into the ball to take the mark, 50m from goal. He takes the set shot for goal and it fades away to the right. The pressure is squarely on the Hawks once again, as they are faced with losing the lead. GOAL CATSSelwood gathers the hand ball, he runs to 50, he kicks to an empty goal square and it bounces through for his third goal of the night. This game is hanging in the balance, you just get the feeling that one of these teams are about to break away. BEHIND CATSDuncan with a quick shot on goal but he is offline and through for a point it goes. BEHIND HAWKSLake with a thumping long ball from 55m out and it is touched on the line for a point. The Cats have got to be careful here, as the Hawks second halves have been very damaging. GOAL HAWKSHale takes the uncontested mark inside the 50. He takes his time, he unloads for goal and the Hawks are back in front. Second half is under way as we are set up for what promises to be a thriller of a game. HALF TIMEScores are level at half time and we have a real game on our hands tonight. GOAL CATSThe Cats take it from the middle, as Walker takes a huge mark in front of Gibson. He comes in and he threads it through. GOAL CATSMurdoch roves the pack as he shrugs off a tackle, runs to the goal square and kicks a confidence booster for the Cats. Selwood has the ball on a string at the moment, with 20 possessions to his name. BEHIND CATSHawkins rises up and takes the mark in front of Lake, 50m from goal. He comes in and pulls it to the left. 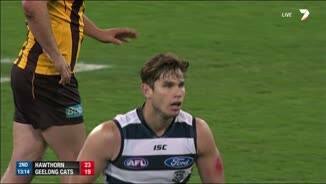 BEHIND CATSDuryea rises behind the pack and punches it through for a rushed behind for Geelong. Update on Motlop: He attempted to come back on the ground, but he is clearly hampered by a calf injury. He is back on the bench, icing it up. The Cats must score a goal before half time, as otherwise they will go into the main break with their heads down. GOAL HAWKSGunston takes a mark in the goal square, he goes back and slams it through the middle. The Hawks hold a 14 point lead. The Hawks are starting to step up their game as they switch into finals mode. GOAL HAWKSBreust drops the mark he should have taken, but Puopolo mops up as he snaps around his body and he kicks a goal. Bad signs for the Cats as Motlop has limped off the grounds. Updates will be provided on his condition as news comes to hand. GOAL HAWKSSmith takes the mark just inside 50, he steadies and takes the shot on goal. The Hawks are back in front. GOAL CATSHawkins over to Selwood, as he runs to the open goal square and kicks the goal to put the Cats back in front. BEHIND CATSHill ends up conceding the rushed behind for the Cats. BEHIND CATSBartel gives it off to Hawkins, who has a shot from 50m, but it sails through for a point. This term is almost a mirror reflection of how the game started off, with the Cats dominating play. GOAL CATSBartel takes a pack mark under immense pressure. He comes in from 40m out and he makes no mistake. The Cats are back. BEHIND HAWKSHodge gathers the loose ball, he kicks around his body and just sneaks it through for a point. Hodge sends it down to full forward but through the fingertips of Gunston it goes as Blicavs cleans up. The first goal of the term will be very important in terms of momentum of the game. The Cats have not had a tackle for about 18 minutes, which is surely a worry for the on field and off field personnel. We are back under way for the second term, as both ruck men prepare to collide with each other. QUARTER TIMEWhat a first quarter of football! First it was all Geelong, then the Hawks dominated, to lead at the first break by nine points. BEHIND HAWKSBurgoyne takes the mark on the 50, he comes in and his shot on goal falls short, being thumped through for a rushed behind. This is a very entertaining match of football at the moment. This is exactly what finals football is made of. GOAL HAWKSPuopolo takes the mark 40m from goal directly in front. He takes the regulation shot on goal and the Hawks are starting to bully the Cats. Hawthorn are starting to look the goods, with the Cats struggling to find an answer. GOAL HAWKSLewis takes an uncontested mark, 35m from goal directly in front. He comes in and scores a goal. The Hawks are in front. This game has gone up a level, as it starts living hype to be one of the games of the finals series. GOAL HAWKSRoughead stalks the ruck contest, as he plucks the ball away, slams it to the boot and kicks the Hawks first goal of the night. Caddy has been in career best form lately and will be a very important player for the Cats during the finals series. The Hawks need to be careful here as the Cats are threatening to make this a final that the Hawks will be wanted to forget in a hurry. BEHIND HAWKSThe ball goes through hands and over the goal line for a rushed behind. GOAL CATSBartel takes the mark 45m from goal, directly in front. He takes the set shot on goal and he threads it through. BEHIND HAWKSTaylor paddles it back for a rushed behind for the Hawks. Josh Gibson is running hot, with six disposals to his name. The Cats have brought their A game tonight, as they aim to upset the Hawks. Hawkins pushes Lake out of the contest, as he attempts to take the mark, but it drops straight through his hands, the Hawks defence clear it to the safety of the boundary line. The Cats have started the game the way they usually start games, grinding teams down. GOAL CATSSelwood takes the mark from the kick in, he plays on as he runs to 50 and he kicks the first goal of the 2014 finals series. BEHIND CATSBlicavs marks on the 50, he takes the shot on goal but it is touched on the line for a point. There are some nerves out there tonight, as the finals series has kicked off with this game. BEHIND HAWKSRoughead gathers the loose ball, he looks to kick it around his body but he puts it through for a point. Enright with a kick from the boundary for goal, but he puts it out on the full. Birchall is just off the mark with his clearing kicks from defence, he needs to get better as the night wears on. The ball is bounced in the middle and we are under way. Welcome to the MCG for the contest between Hawthorn and Geelong. There are no late changes for either side. The subs are Simpkin (Hawks) and Thurlow (Cats). HAWTHORN is one win away from a third consecutive Grand Final after defeating Geelong by 36 points in a gripping qualifying final on Friday night at the MCG. Sam Mitchell, Bradley Hill and Isaac Smith were dominant in the midfield, while Brian Lake held Tom Hawkins to just one goal as the reigning premiers won 15.14 (104) to 10.8 (68). Jack Gunston did much of the damage on the scoreboard for the Hawks, kicking three goals and narrowly taking the points in an engrossing duel with fellow All Australian contender Tom Lonergan. Jordan Lewis also booted three majors, two of them late as the Hawks kicked four of the final five goals of the game. 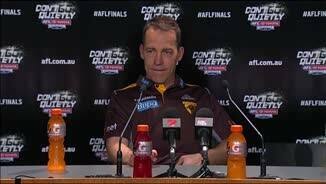 "We were really pleased with our endeavour tonight," Hawthorn coach Alastair Clarkson said. "We tackled well and put a lot of pressure on the Geelong ball-carrier. "You just need to persevere in big games against quality opponents. We stuck at it and eventually broke the game open later on." 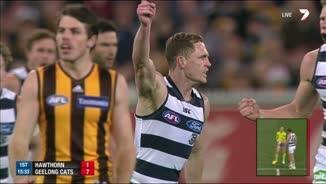 Cats skipper Joel Selwood did everything he could to drag his team over the line. He finished with 31 disposals, nine clearances and three goals, while Jimmy Bartel was another impressive performer, booting two majors, gathering 20 touches and taking a couple of sensational marks. Steve Johnson slowed after a superb start, a foot injury that sidelined him for three weeks clearly limiting his impact the longer the game went. However, Geelong's hopes were undone by their inability to kick a competitive score, with Hawkins eclipsed by Lake one week after he kicked a career-best seven goals against the Brisbane Lions. Chris Scott did his best to conjure some magic from the coaches' box, throwing Harry Taylor forward in the second half. But his team was unable to make up for the lack of goals from Hawkins. "I'm not saying we were unlucky or anything like that," Scott said after the match. "We just couldn't execute our skills well enough on the night. "But early on, I thought the pressure of the game, the opposition and the occasion probably showed with both sides. "There were some easy marks dropped and it was a bit uncharacteristic of both sides. "But in the end we just made too many mistakes too often … and our forward line didn't function well enough." Although Hawthorn largely controlled the final quarter, the first three were typical of the recent contests between the clubs, with the pressure fierce and the momentum swinging back and forth. Geelong, which had lost only four first quarters for the season, made the pace in the opening 15 minutes. The Cats kicked the first two goals, with much of their midfield drive coming from Johnson, who was back after three weeks on the sidelines with a foot injury. However, the Hawks then took control, snaring a nine-point lead by quarter-time and extending their advantage to 14 points by midway through the second term. Scott's men soon rebounded, kicking two goals in the last minute of the opening half – the second of them a long bomb by Josh Walker after the siren – to level the scores at the long break. Hawthorn regained the upper hand by kicking four goals to two in the third quarter, and the Hawks then ran riot in the final term. They had the game in the bag when Roughead extended their lead to 22 points by slotting a curling long-range snap with seven minutes to go. With their supporters dancing in the aisles, they piled on three more goals for good measure. It was the greatest margin between the teams since round 22, 2006, when the Hawks beat the Cats by 61 points. Having broken an 11-game losing streak against Geelong in last year's preliminary final, Hawthorn has now defeated the Cats three times in four matches. The latest victory means the Hawks will enjoy a week's rest before hosting a preliminary final at the MCG. The Cats will be back at the 'G next week, fighting to keep their season alive against the winner of Saturday's clash between North Melbourne and Essendon. Other than Selwood and Bartel, their best performers were Travis Varcoe, Josh Caddy, Cameron Guthrie and Mathew Stokes. 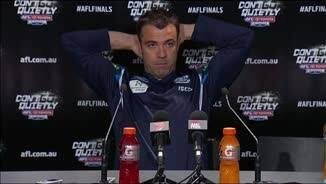 The downside for Geelong – and the upside for the Hawks – is that the qualifying final winners have gone on and made the Grand Final in each of the past seven seasons.